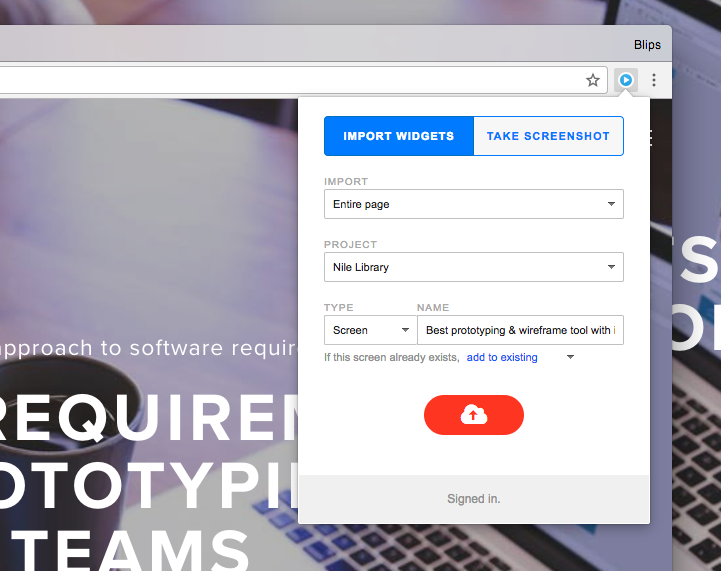 iRise Web Importer is an extension for the Chrome browser that allows you to import screenshots of web pages or import the contents of web pages to iRise. NOTE: This initial version imports only Text and Image <img> elements from web pages. More elements will be added soon! Following are installation instructions, brief usage instructions, and some advice. You should now have an extra blue button in your tool bar. Be sure to refresh the page you want to import before running the plugin for the first time (the plugin must be installed when the page loads). When first launching the extension (by clicking on its icon in the Chrome toolbar), you will need to supply the URL/address of your Definition Center. Be sure the include the "https://" in the address you provide. Once you've entered the URL into the iRise Address (URL) text input field, click on the Sign Into iRise button. This will launch Definition Center in a new tab. If you are presented with a Sign In screen, log in to Definition Center as you normally do. If you are already signed in, you can switch to a web page you'd like to import and open the iRise extension again. Scope: Currently, you can only operate on an entire web page. Subsequent releases will allow you to narrow the scope of what's imported. Project: You must choose the which project you want to import your web page into by selecting a project in the Project dropdown. This will be populated with the list of all accessible projects on your Definition Center. Once you've made a selection, the selection is remembered for subsequent invocations of the extension. You may choose a different project at any time. Type: Currently, you can only import widgets and screenshots into Screens in iRise. Future releases will expand the set of options. Page Name: You must also name the screen you want your web page imported to. By default, the title of the imported web page will be used (if it has one). You can supply a different name by typing it into the Name text input field. Page name conflicts: If the name matches an existing screen in iRise, the web page will be imported into that iRise screen. Currently, when importing into an existing iRise screen, the imported widgets and/or screenshot will be added to the contents of the existing screen. If you want to create a new screen, be sure to supply a screen name that does not match an existing screen name. Future releases will support options to overwrite or automatically create new screen. Once you're ready, click on the red upload or camera button near the bottom of the extension popup window. This will change to a green "in progress" spinner until the import is complete. Successful completion will lead to a green checkmark. If errors occurred, you'll see a red warning symbol. Currently, there is no indication of what elements do or don't import successfully, other than inspection of the iRise screen contents after import. If you experience the red warning symbol often after import, contact iRise and we can work some developer magic that may help us diagnose the problem. Only tested with 100% zoom. There are several cases in which text runs will not be positioned correctly in iRise. We currently treat as ignored any elements that have negative X and/or Y coordinates. No validation is done on screen names. If the most recently used project is deleted, the plugin incorrectly shows as ready to operate. White text will not appear visible unless the page background color is changed to something other than white. Browser security prevents mixing HTTP and HTTPS resources, so importing from an HTTP site into an HTTPS Definition Center (or vice versa) will result in some resources not importing properly. Pages that reference fonts via relative URLs will not import properly (some fonts will be missing). Animations and transitions may negatively affect the results of import. Not all fonts will be imported correctly in some cases. Line-height for "normal" is guessed, not calculated. Studio crashes if viewing the page being imported. You may get a notice that "Developer mode" extensions are installed on restart of Chrome. You can cancel this message. Trying to import the widgets when viewing in Editor the screen you're importing to may cause a world-ending infinite regress.